Communication Science Computing Lab is located in Rm. 4050, Vilas Hall. It is a multifunction computer lab dedicated to teaching and research in Communication Science. 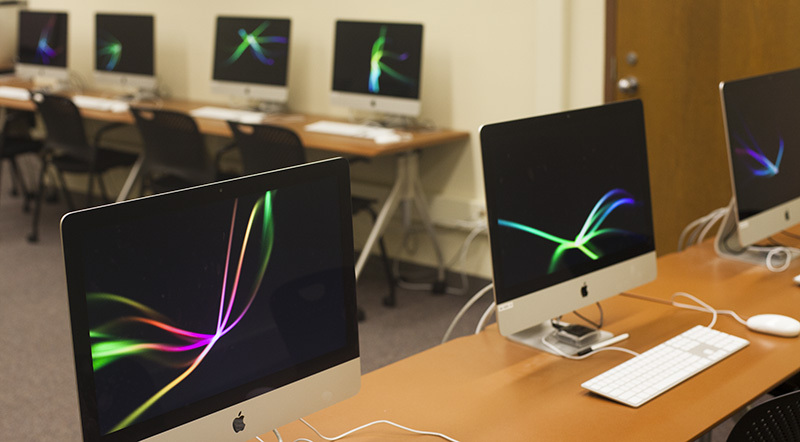 The lab consists of 16 iMacs (including an instructor’s station) with full Internet connections. In addition to the regular Microsoft Office package, the computers are equipped with data collection software such as MediaLab and DirectRT for conducting computer-interfaced laboratory experiments and online surveys as well as statistical software such as SPSS for data analysis. Communication Science Research Suites are located on the 4th floor of Vilas Hall. They consist of a variety of large and small spaces that can be configured for solo, dyadic, or group research participation. Digital video recording allows for subsequent detailed coding of participant behaviors. The Center for Communication Research administers an active undergraduate subject pool every semester via Sona human subject pool management software. In a typical semester, over 1000 credit hours are administered, providing a key resource for faculty and graduate student research. Those who wish to gain access to the subject pool should contact the CCR director, Marie-Louise Mares. Faculty at the Center are each assigned labs. These serve as a resource for meeting with research teams, storing data, and as additional spaces for data gathering.